A note is a public post and appears in the News Feed for all fans or customers to see, and anyone tagged in the note receives a notification. The Notes app used to be the only place to publish a really long post, but now you can have an almost unlimited number of characters (currently more than 63,000) in a regular post, too. You can create a note and tag people and Pages to view it. You can tag your Friends and any Facebook Page. When you create a note, a notification appears in your Page Timeline and goes out to your likers’ News Feeds for everyone to see. Click the Notes app in your Page’s app section below the Cover image. If you don’t see the app, you need to add it to the app section. Click the +Write a Note button in the top-right corner. This button opens an editing space where you can create a title, type the text of the note, tag people and/or Pages, add a photo, preview, save a draft, and publish. Enter the title and body of the note. You can use a few editing tools, such as bold and italic. A note can be really long. 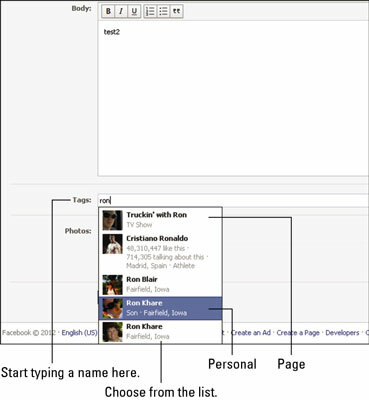 To tag a person or a Page, start typing the person’s name or the Page name in the Tag field. 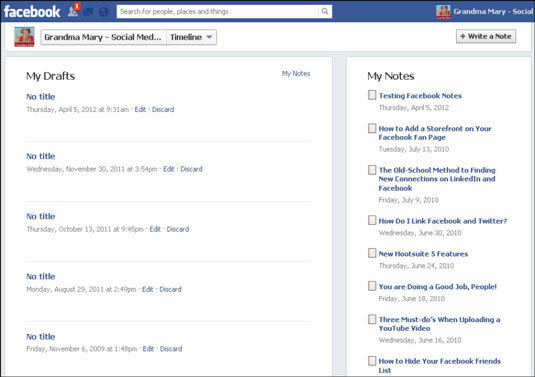 Facebook displays a list of your Friends and Pages. Click the ones you want to tag. Click the Add a Photo link, find the photo on your computer, and upload it. Click Publish, Preview, Save Draft, or Discard. Publish: Your note is published to the world! The note shows up as a Page status update and appears in likers’ News Feeds. Any people or Pages you’ve tagged are notified. Anyone can read and comment on your note. Preview: When you click Preview, you see exactly how your note will look when viewed. It has two links at the top: Publish and Edit. You can edit the note by clicking Edit or go ahead with the publishing process by clicking Publish. Save Draft: The next time you want to edit the note, look for the Notes app box. When you click that box, a Page Name Drafts link appears next to the Page’s name. Click the Drafts link and you see a list of all your note drafts. Just click the title you want to start editing. Non-Admins won’t see the link to your drafts. Discard: Discarding a note removes it from your drafts. Discard is a way to delete before something is published. When your visitors click the Notes app, they go to an interface with your notes on the left and notes by other Pages they’ve liked on the right. Many Pages use the Notes app to create a daily list of events in their stores or a daily webinar schedule with quick links to the Event pages. There are many ways to use this particular app.